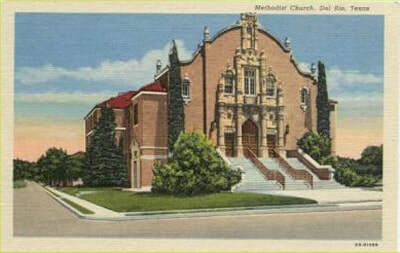 Methodism in Del Rio- a short history. The "Stone" Church on Cemetery Street now Pecan Street opposite the Val Verde County Courthouse. As was the custom back then, the parsonage was right next door. Built in 1903-1904. Although it was decommissioned as a church when the present building was built, it is still standing today and is currently being extensively refurbished for a community meeting building. The "Stone" Church on present day Pecan Street. Above the front doors was a Half moon shaped stained glass window which said Methodist Episcopal Church South and the 1904 date. The congregation grew to slightly greater than three hundred members by 1917, as members opened their homes to soldier trainees at Camp Del Rio, later known as Camp Michie. 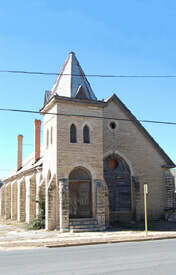 The church was also used and shared with the local Episcopalian Church at one time.Because of this and the continued growth of the congregation this created the necessity for another, larger facility, Implementations began as property on Spring Street, which was once a cemetery and located a few blocks north and east of the Pecan Street church,was purchased. Most of the graves were relocated, although it is said that some were never moved, and the first service in the new building was held on May 31, 1931. The larger sanctuary was well justified, as the congregation doubled in size to over seven hundred members between the World Wars. The growth of the city and the opening of Laughlin Air Force Base facilitated the enlargement of the membership to more than nine hundred during the 1960s. In 1968, The Methodist Church and Evangelical United Brethren church merged into The United Methodist Church. Our church has promoted missions and charitable work after numerous hurricanes, earthquakes,floods,fires as well as abroad in Mexico and Liberia and also provides numerous out reach programs throughout our local community. The 1950-early 1960 FUMC. Notice the "cross" on the left side of the building which was attached above the side door. This was a neon light fixture that was painted dark blue with red neon lights that spelled the words "First Methodist"
The Aleppo Pine trees on either side of the front of the church were growing well and lasted until the early 2000's before an incurable tree fungus infected them causing their removal. A pen and ink drawing that Dr. Horace W. Van Cleave did of the Del Rio Church. 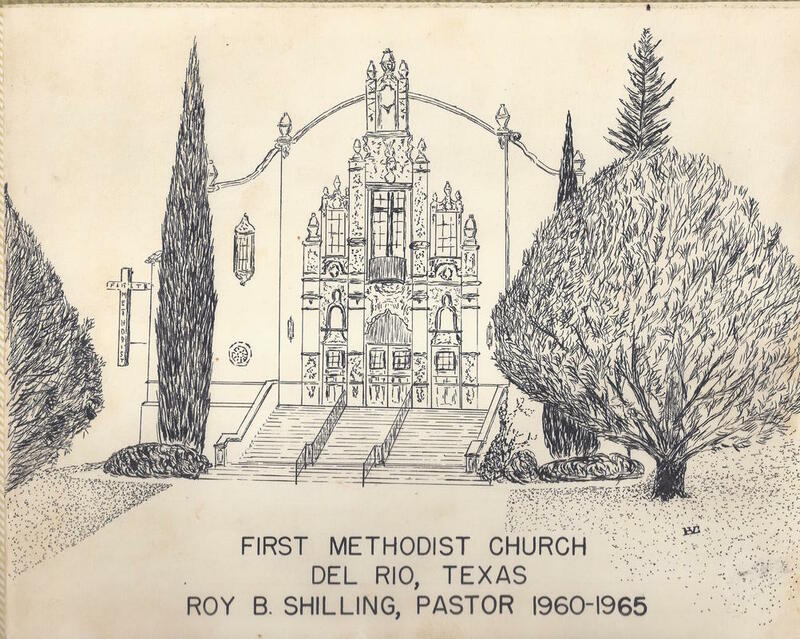 When Rev.Shilling retired he did the drawings of each of the churches he had served. Dr. Van Cleave was the husband of Beth who was one of children of Pastor and Mrs. Shilling. 1960's-1980's postcard view before our massive Aleppo pine trees became infected with a fungus and had to be removed.